When you work with digital image files, at some point we usually convert from RAW to TIFF. I choose TIFF export anytime I end up sending my images to Photoshop. The TIFF format supports both 8-bit and 16-bit color depth, layers, and Photoshop Smart Objects. The TIFF format is also open and well-documented, so most editing/viewing software can read it. When you save a file in TIFF format from Photoshop, you get several options for compression. You can choose from no compression (uncompressed), LZW compression, or ZIP compression. ZIP compression is a newer option. I decided to take a quick look at these three saving options and see how they compared in terms of file size and saving speed. 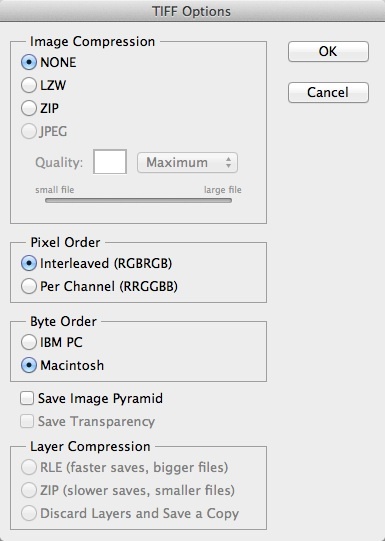 When saving a TIFF in Photoshop, you’ll have several compression options.